Neo’s vision of life with work. Hope he likes everything tinted green. They ask it urgently, with earnest expressions indicating a mix of confusion, fear, and excitement. The reason they ask is typically because they don’t know what they’d do with all of those empty years, either. Love it or hate it, work fills most of the space in your life. It gobbles time like pacman eats dots, and as an added bonus, it provides a path through the maze of your existence; you know exactly which direction you’re expected to grow. So, if you are close to the end of your early-retirement journey, it’s possible you’re asking this question to yourself. What will you, in fact, do with all that free time? Despite having firm plans to retire and reclaim their lives, many people find elements of doubt creeping in here and there. Do you actually have enough interests and activities to sustain you? Will you get bored? Of course, some lucky people already know exactly what they’re retiring to, answers firmly in hand. It’s been a lifelong dream of mine to quit my current career and take something lower paying and more meaningful: teaching or contributing to a non-profit. I’m going to do a lot of parenting. My kids can easily eat 14 hours a day, every day. Might use my current skills but in a more entrepreneurial way, like writing applications and selling them on Google Marketplace or inventing the next Elf on a Shelf. I am basically The Dude from The Big Lebowski, in the flesh. I’m certain that I can be happy indefinitely just doing nothing and hanging out, man. I will abide. If you are one of these people, congratulations. You’ve already got the answers you need. Although you may be retiring FROM something, you’re also very clear on what you’re retiring TO. You can stop reading right now. Hopefully you’re not as desperate to leave your job as Neo was. Let’s talk a bit about the idea of loss. Having a sense of loss is not restricted to things that you like or love. Most people eventually wind up missing things that they’re familiar with. Pleasant or unpleasant, when something is removed from our lives, we tend to want it back after a while. The dog that chewed up our shoes, ruined our furniture, and bit the neighbor starts to appear adorably misunderstood. Or your horrible ex-lover who told you they were quote “working” during nights and weekends when they were actually swiping around on Tinder might seem worth another chance. The point is, after some time apart from them, we may only remember the good aspects of these relationships. The problem is that this all-too-familiar human tendency might result in an ill-advised 3AM drunk-dial to your old flame in a desperate attempt to rekindle the relationship, because you (incorrectly) think there’s something there that makes it worth saving. Don’t do it — don’t go back to work. Some losses are net gains. Leaving an unsatisfying job is one of them. Try to accept the loss for what it is — a necessary part of your transition to a better life — and move on. Having an exciting and fulfilling vision of the future may help you both leave your current job and prevent a return to drudgery. Let’s return that original topic. When most people ask you what you’re going to do with your free time, they typically see you sitting at home, alone, in an empty space. The loss of work may appear to make you vulnerable, weak, and isolated. I think of this as the Blank Room Problem. When you take something away, you leave a void. There’s an area that needs to be filled. 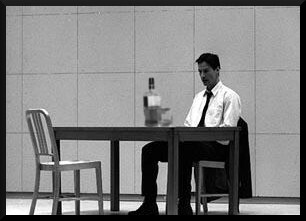 The only thing more boring than an office: A room full of emptiness. Nobody wants to do nothing. In fact, being placed in solitary confinement with zero stimulation is routinely used as a method of torture. It literally drives some people crazy. People need people, and people need things to do. 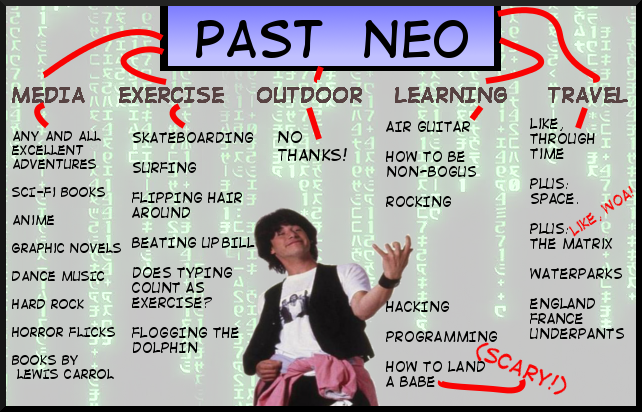 Much like Neo populated his Matrix, so must you populate your own domain with new stuff. If your Future Room is blank, you have some work to do. It’s time to furnish that sucker. So how is it done? You’ve almost certainly been working for at least a decade (and perhaps as many as five!) and now you’re suddenly asking yourself what you want to do with your remaining time on the planet. How exactly are you supposed to build a different life? At any rate, the idea is that you evaluate three different versions of yourself: Past, Present, and Future. And you ask each incarnation: What do you like to do? Past you might have liked roasting marshmallows, riding a bike aimlessly around town, and dancing. Great. You draw a shape for “past you” and then draw lines off of the center, like spokes in a wheel, which connect to the activities themselves. Spoke #1 connects to biking, spoke #2 to dancing, and so on. Create as many spokes as you can. Found this sample tree on the ‘ol internets. Although there are no spokes, and active doesn’t need to be its own section, it gets the general idea right. Some of this stuff looks like fun. 1. Do some stuff that other people want you to do. In other words, consider adding a section for people in your life that you want to spend more time with. Then call them up and ask them to list activities that they like, but they’re pretty sure that you don’t. Plan on piggybacking on their lives a bit. You might be surprised to find their various interests rubbing off on you. 2. Be active. Make sure that some of your activities and goals will keep you at a reasonable level of fitness. Exercise is a critical part of mental and physical well being. Additionally, when your body isn’t working at an acceptable level, it can make it more difficult to engage in things that would normally make you happy. 3. Write down a few activities that make you squeamish or uncomfortable, preferably some you can’t really see yourself doing, even though there’s no technical reason why you can’t give them a shot. Why? Here I’ll quote Star Trek actor Leonard Nimoy, who famously portrayed Mr. Spock. And believe me, I was terrified to put on those pointy ears, afraid that they would stigmatize me, ruin my career. At the time I thought there was a distinct possibility that no one would ever hire me again. In the end, that’s precisely why I did it. It was the best decision I ever made. A few examples: Camping in the woods (OMG Snakes! ), biking all the way across your state, learning to square dance, performing in the local theater, getting involved in your city council, eating grasshoppers. If you want to get even more detailed in your own document, you can add different areas to think about for each sub-tree, e.g. media, skills, travel. This can help jump-start thoughts by providing a starting point. Here’s a sample page for ‘past’ Neo. Before becoming The One, Keanu was Ted. If you follow this method, you’ll easily wind up with tons of stuff to do, scattered over a few pages. And feel free to get as detailed as you like. For example, after listing “Action Movies,” you might add thirty spokes, each pointing to a specific title you want to watch. Another tip: Rather than simply writing “volunteering” (a nebulous, half-baked goal) make it real: Door to door campaigning for my favorite political party. Joining the PTA at my child’s elementary school. Mowing my 95-year-old neighbor Matilda’s lawn biweekly. You get the idea. Specific things feel simultaneously more exciting and achievable. Don’t be afraid to flesh out some details. Also keep in mind there are no hard and fast rules to creating your own life tree. The end goal is simply to have reams and reams of activities that you might find interesting, exciting, and fulfilling. Ernie is not standing over your shoulder making sure you follow his process to the letter. And another thing. After leaving employment, when you begin to solve your own Blank Room problem, I advise starting with the present version of yourself. In other words, make it a point to continue doing activities that you enjoy, so that you maintain a comfortable baseline. After all, the act of leaving work doesn’t — and shouldn’t! — instantly make you a different person. You’ll still have your family and friends around to spend time with, your garden to tend, your walks with your dog around the neighborhood. Go in with the expectation that you will still be, fundamentally, you. Then, slowly, you’ll build in some of the other stuff, mixing and matching until you find a good balance of ‘comfortable old’ awesome and ‘new experience exciting’ awesome. When you hit that inevitable patch of boredom or malaise, you can easily return to these lists, pick some terrific new stuff to do, and get moving again. By now you get the idea. Using your knowledge of yourself (read: your preferences), you’re going to create a seemingly endless stream of things to keep you engaged and occupied. The only remaining question is: When do you work through this thought exercise? Although you can do it anytime, I believe it’s best to do it while you’re still employed. This is because you are still moving, active, and excited about leaving work — you likely have a million bottled up goals that you perceive your job is preventing you from accomplishing. So go nuts: Fill an entire notepad. Invite your significant other to share in the creation. Treat it like a living document and continue expanding it over the course of a week. You might notice you think of different things at various times of the day as you’re subjected to different forms of stimulus. For example, when you see your boss in the hallway, you might think: I’d love to be a trained boxer so I could knock his block off with a single blow to the temple. Terrific: Open a text file on your phone and punch it in. There are multiple benefits to starting this process early. a) It’ll help you to solidify what it is that you’re looking forward to after you’ve finished working. b) If you do hit a rough patch in retirement (read: you get bored or listless), you’ll already have a ton of exciting stuff listed out. c) Third, and most importantly, you can start work on stuff in your life tree right now. There’s absolutely no reason to wait. In fact, it’s helpful to get a little momentum on building a life outside of work before you leave it. Besides, your working career needs to be something worth living, too. Don’t subscribe to the deferred life plan. You only get one of these, you know. All that being said, you may be so flustered and busy while working that it doesn’t seem possible to sit down and do this kind of dreamy-stuff while holding down a full time job and simultaneously tending to your family of eight and whatever else. If this seems to describe you, it’s OK. Quit first and make your life tree later. After a couple of weeks of rest and detox you can get to it. Just make sure you do, in fact, get to it. If instead you find yourself sliding into a life of inactivity and too-much-television-watching, you’re probably headed toward a rut. Look, nobody starts out wanting to retire just so they can binge-watch entire seasons of sub-mediocre television shows. If you find you’re eating a carton of ice cream every day while watching reruns of Reba! followed by Judge Judy and god knows what else, it’s a sign that maybe things aren’t going that well. If you notice this sort of thing happening, it’s not too late: grab a pen and paper, build your tree, and get busy living again. Fact: The majority of people on the planet have terrible time management skills. Before you know it, you don’t have time or energy left to do the things you actually wanted to do when you started the day: Hiking at your state park, or registering to help out at your local foodbank. If you find that you’re having a great deal of difficulty getting started doing things on your life tree, I strongly recommend scheduling as a solution. Take a look at a few of the activities that are pretty easy to do and enter them into specific days on a calendar. I realize that if you use this approach, you might be running a risk of making your post-work life feel like, well — work. Didn’t you retire to get away from scheduling? To that I’d just remind you that there’s no need to over-schedule and if you find you’ve overbooked yourself, simply pull back. Leave at least a couple days a week blank. Still, for certain types of people, dropping events into specific days is helpful. This approach gives you concrete events to look forward to and plan for. ** If you’re interested in reading a bit more about scheduling your non-working life, consider reading About A Boy, by Nick Hornby. (There’s a movie, too. It’s pretty well done, despite the presence of Hugh Grant.) The main character is in his late 30s and is fairly content chunking his days into intervals containing different activities. 1. This is not a bucket list. You are not constructing a list of tasks to mindlessly accomplish before you die. Instead, you’re exploring areas of life you find rewarding and want to do more of. If you find an item or two that you get particularly excited about, just keep doing that stuff. This is actually a terrific result, because it means you’ve found a legitimate passion. Life without work is, ideally, dynamic and fun, not a mechanical processing of jobs in a queue. We are not robots. 2. Once you’re done with your list, save it somewhere where you won’t lose it. If it’s digital, put it on dropbox or sync it to your apple cloud, whatever. Consider printing it and hanging it up on a wall somewhere you can’t miss it. This is your life-is-amazing roadmap, and will serve to get you back on track if you ever get lost in retirement. 3. Note that you can add to it at any time. It’s a living document — your tree. Water it occasionally. 4. You don’t have to use this list at all. 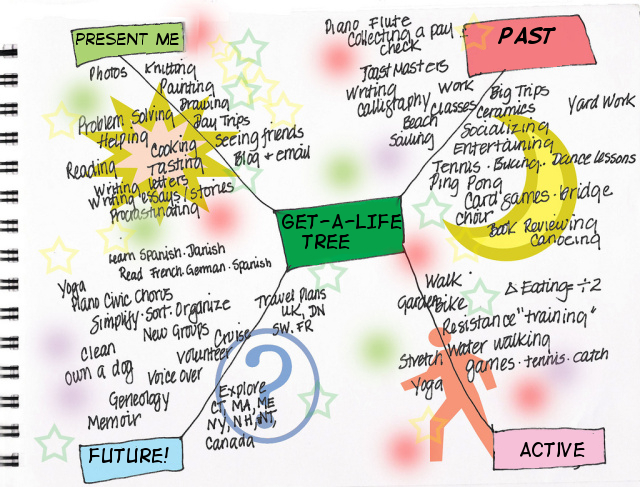 Creating the Get-A-Life tree is, for all intents and purposes, a backup plan. Many people instinctively know what to do with their time once they’ve stopped working. If you turn out to be one of them, that’s terrific. But if it turns out you’re not, you’ll always be able to refer to it. 5. Whenever possible, add a social element to a goal. For example, if you’re single and you want to practice cooking, invite a friend over to share the meal. If you’re taking dance classes, convince your significant other to join you. (Mine unfortunately convinced me…) If you want to write, join a local workshop. Most people do much better working on hobbies with other people. The give-and-take feedback that comes from being social helps your average human grow faster and connect better with passions because you’ll be adding additional meaning to them. 6. It’s completely okay to have goals that might make you money. Just because you quit your main career doesn’t mean you can’t do anything that will result in earnings. As long as you’re excited by the goals, they’re legit: Write them down. C’mon, Neo — You could have furnished your room any way you wanted, and you picked THIS? So why am I going on and on about all of this stuff? Simple. I believe that your mental well being in retirement is just as important as the financial side of things. My general observation is that most people obsess on finances (Do I have enough? What are my backup plans and safety nets? And so on…) and not nearly as much about the rest of it. Look, if you retired and the following day, your investments lost 50% of value, you’d worry, right? You might consider making some small changes such as dropping your spending to a lower level as you wait for values to return. Some folks might even immediately go hunting for a job again. I think it’s just as important to recognize it if your retirement isn’t going well for you emotionally. If you’re not as happy, why not? Shouldn’t you have analogous backup plans? I know I’m repeating myself here, but your tree is both a plan as well as a safety net of sorts, a constant reminder that you have plenty of skills, interests, and options available. In other words, you’ve already solved the empty room problem and it’s chock full of great activities, just waiting for you to get going. Thing is, I’ve seen it go bad, firsthand. My uncle John retired early, in the late 90s, at 56. He’d bought a lot of Coke stock in the 80s and held onto it, making a small fortune in the process. Three years after quitting his job as an auto-mechanic, all he did was drink beer, watch sports, and attend family events completely sauced. John put on 60 lbs in short order, and looked terrible. I can’t imagine that’s how he envisioned his retirement. My dad (John’s brother) revealed to me in 2005 that John was basically miserable through-and-through, had no other hobbies, and was driving his wife and children insane. A late-term divorce to his wife of thirty odd years tragically followed in 2007. He died last year at 72. Sometimes I wonder if he would have done any better if he made more of an effort to, er, branch out. Because from my perspective, he got the finances right, but not much else. Given the bleak character of the room he’d furnished, he would have been better off continuing to work. This makes it easy to respond to the next person who inevitably asks what the heck you’re doing with all of that free time. Invite them into your room — show them around, point out all sorts of stuff you’re both doing and planning on doing. Once they see how great everything looks, they’ll stop asking that motherloving question. You’ll finally be unplugged from the Matrix. **I’ve posted an incomplete version of my own brainstorming sessions, if you’re interested in taking a look. Might look pretty boring to a random internet reader though, because it’s a very dense-looking list. But it looks amazing to me, because it reinforces my belief that I will never be bored in retirement. There’s too much awesome stuff to do. This entry was posted in FutureLife. Bookmark the permalink. Most people consider doing this sort of post-retirement goal mapping something to do in the later stages of your journey, and only if they’re having trouble figuring things out. At 13 years out, I’d think you’re probably in the exempt category 🙂 You might be surprised, though — a clear vision of the future, conjured in your your mid-20s can potentially look pretty muddled and different by the time you’re approaching 40… Agree, though, I’m still pushing a mower across my lawn, too – hope to keep that up pretty much the whole way. Good post. I was wondering why you didn’t update last week, now I think I get it. This one was pretty long. Surprised to see it come out Monday, though, I thought you did Tuesdays. 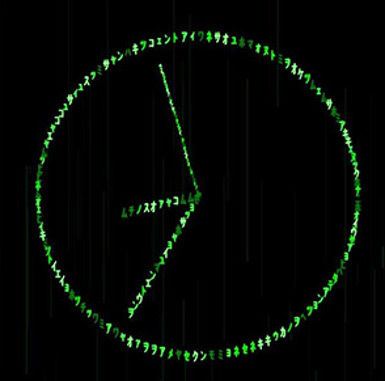 When are you unplugging from the matrix? My wife and I are in the middle of moving and the process is taking hours away from blogging. Post frequency might be spotty as a result. Re: Unplug, I’m giving my notice a week from Monday, making it the 23rd. Having to figure out what to do with all your free time is a problem I’d happily take. Love the Matrix analogy. Makes it memorable. Yeah, I’m psyched for it myself. Although I’ve had a fair amount of time outside of work over the past several years, it never seems to be enough, and it’s consistently more rewarding than office-time. Thanks for the comment! Thanks for the post, something to think about. My weeknights and weekends are already full with classes and activities that I think I would have no problem filling my time. Thank you for your posts, I look forward to them, I was hanging out for this one, please keep writing them. It’s terrific that you’ve got a head start – you can seamlessly carry your non-work passions over into your ER life and then expand them or add others. This is going to make the transition easy for you, I’ve no doubt. The life-tree is something I might pass along to The Alchemist. We just had a pretty far-ranging conversation tonight about our retirement plans. Too many unknowns, but we have a goal and a timeline we want to hit, and if we don’t hit it financially we’ll make it work. Gotta post in the bucket about the various “possibility spaces” we are looking at, just want to sleep on it before posting it. Spoiler: looking like we’re going to go the ultra barebones “back to the land” escape route and figure it out from there. Interesting to hear you’re accelerating the timeline, that’s great. If you’re willing and able to be flexible with regard to how you handle the future, there’s no reason to wait. People (like me) who go with ridiculous safety margins tend to be — well, less flexible. (read: terrified of ever going back to work.) Very happy for you. This is the biggest worry about financial independence, yet six months after leaving the office almost everyone wonders what the heck they were worried about. My Get-A-Life tree printout has been sitting on my desk for over 13 years. Maybe someday I’ll get around to filling it out… but not yet. Life’s just been too busy. Thanks for the comment, Nords. I seem to remember you surf and do some form of martial arts, which are fantastic passions. Still, it’s really cool that you still have your GAL tree somewhere. 13 years in ER! You’re an inspiration. Really great post, the most comprehensive on the subject that I have come across. I guess it has been on your mind 🙂 We are in a relatively new ER sweet-spot by having the ability to connect with like-minded people, their interests, and basically have all the distraction we could want due to what is available cheaply on the internet – and even more new stuff every day! – as long as we don’t abuse it. I hope that the majority of my post-retirement activities are spent away from the screen, but it’s pretty amazing to have an internet connection in your pocket at any time and anywhere in the world. Just one of the many reasons why ER seems to be gaining traction – augmented by the virtual world and how accessible travel has become, most younger folks can’t imagine life having blank space, there’s just way too much ‘content’ out there! Agree with your comments about the younger generation. I suspect the constant stimulation from ‘the internets’ increases the sense of possibility in life. I, informally, tried to do this with my 67 year old, semi-retired Dad who refuses to ever quit working. Holy frihollies! Workaholics really don’t have any other wants and passions than, well, work! Sad, but also a little funny. It was like pulling teeth. Then, he tried to convince me that this happens to all people when they get older. They’ve “tried everything” and can’t possibly pick up any new hobbies that they’ll like. I guess you’re doomed . I would hazard a guess that your Dad is a bit like mine. Also a workaholic – he’s retired now at 72 but has struggled to find anything to really ignite him. He recently took up tutoring, though, which seems like it might be starting to hook him a little bit. (He’s bonding with a couple of kids who call him Mister, despite his attempts to get them to say his first name — cute. Probably they do it just to irritate him.) So, there’s hope. Old dogs can learn new tricks – Mythbusters proved it. And more anecdotally, I saw a woman who must have been at least 70 texting on a smartphone last week. Pretty sure she learned how to do that recently. HEY LAFI! I’m excited for your upcoming transition!!!! I work for a nonprofit but if I could retire now I’d volunteer full-time. It’s just not as much fun when you get paid for it! I’d also get, like, 5 dogs.